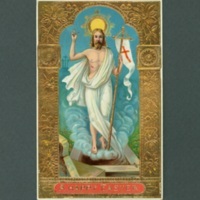 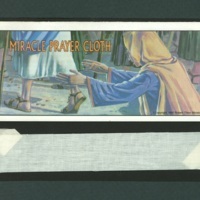 This chromolithographed postcard depicts Christ, post resurrection, displaying his wounds (including the spear piercing his side, but lacking the marks from the crown of thorns). 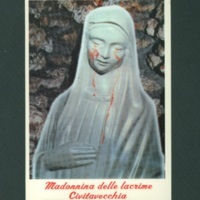 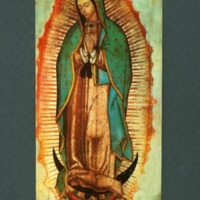 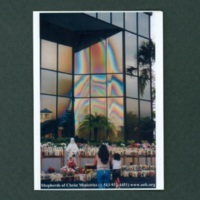 This pro-life devotional card features an image of the Virgin of Guadalupe on the front of the card and on the back gives a message and a prayer on the topic of "spiritual adoption" of unborn babies. 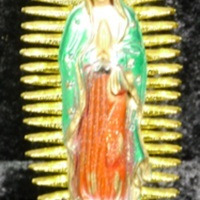 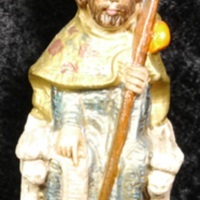 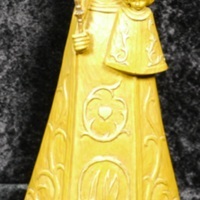 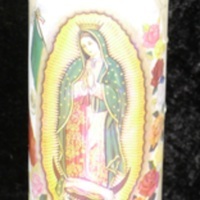 This small figurine of the Virgin of Guadalupe is made of molded plastic, with the aura molded separately and attached, and includes a magnet in the base of the statuette.